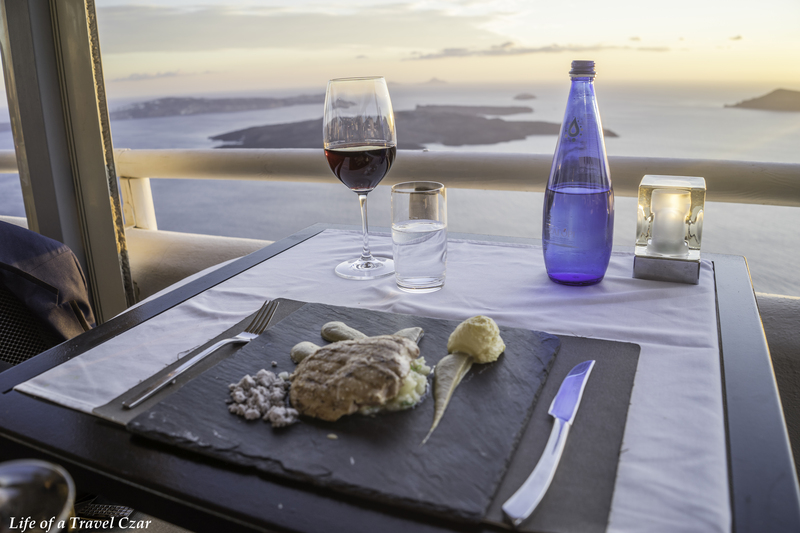 I had the pleasure of a sunset dinner at La Maison Restaurant. 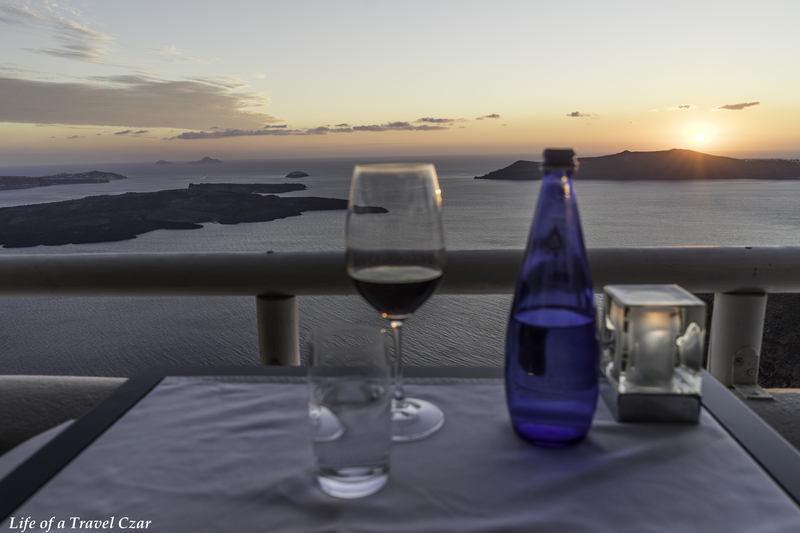 The restaurant is one of the best restaurant’s in Santorini to view the sunset and it is located in the lovely village of Imerovigli. 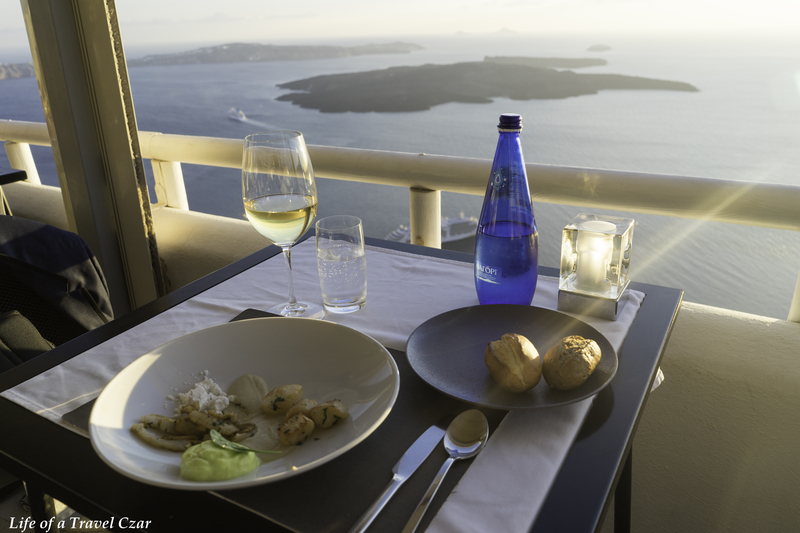 My tip is to make reservations as far in advance as possible to snare a table on the edge of the restaurant with unobstructed views of the Santorini sunset. 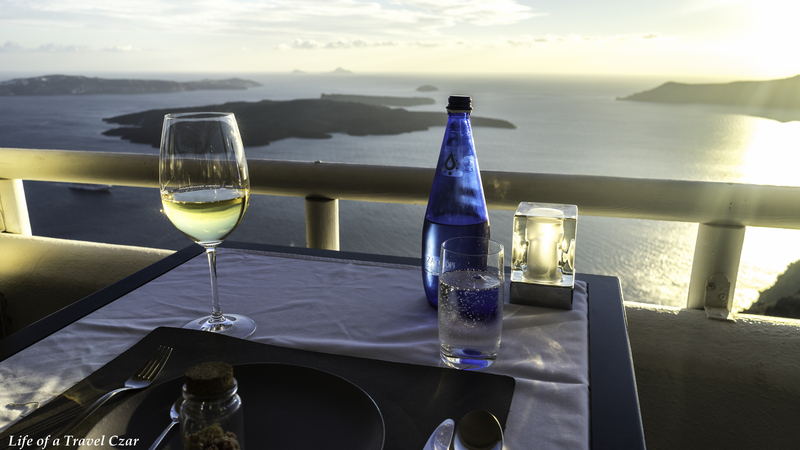 The restaurant is situated on the main pedestrian walk in Imerovigli and is not directly accessible by car as it is pretty much on the cliff-face. 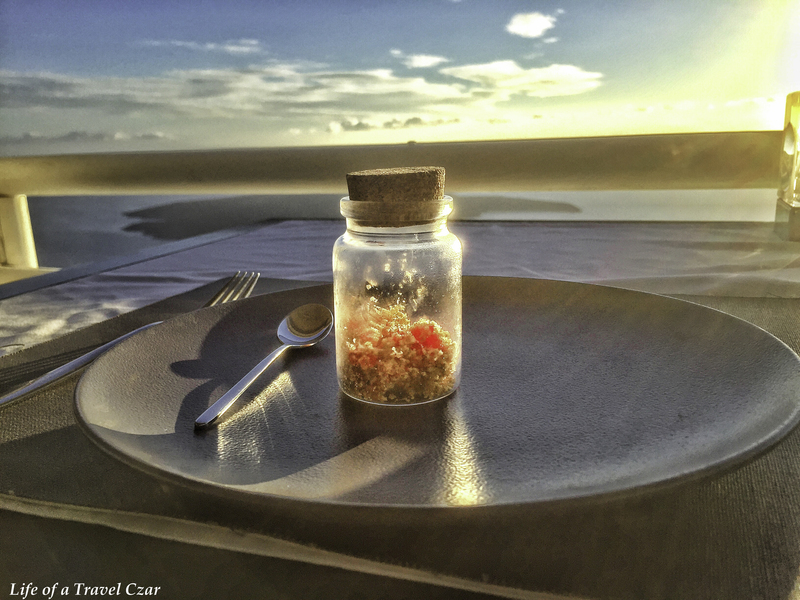 The amuse bouche does its job. The rich juicy tomato coral, the crunch of the breadcrumb and creaminess of the fromage are a textural splendour and a palate awakening flourish. For the entrée I opt for the Scallops. 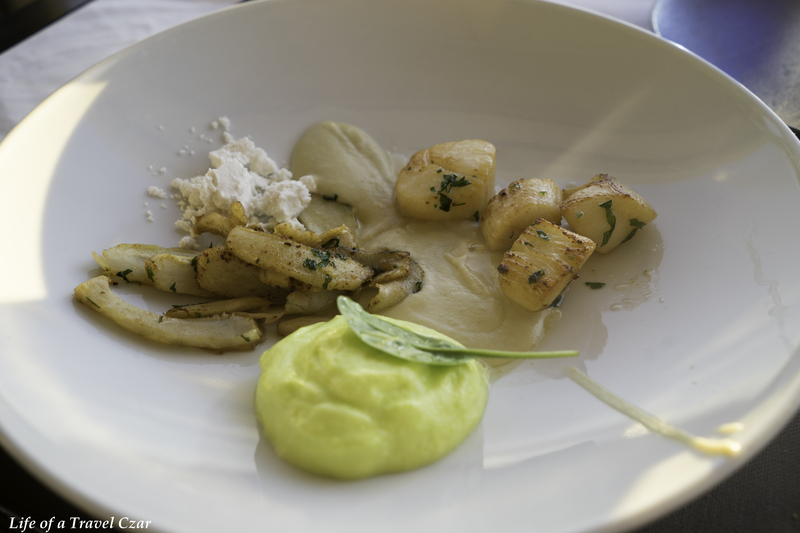 The scallops have a rich minerally salty sea flavour which is delicately balanced by the acidity of the lime puree. The artichokes have a light smoky overlay. 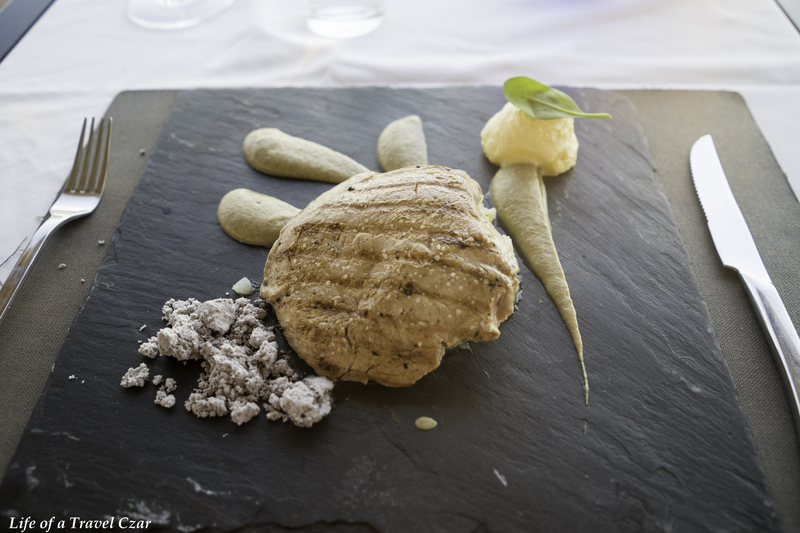 The artichoke and the puree is soft with a delicate flavour and they both form a nice mix of textures. The hazelnut powder also adds a wonderful textural contrast to the dish and integrates well with the artichoke puree as a spread for the scallops. The wine is extremely aromatic with wonderful floral blossoms on the nose. On the palate the flow of lovely citrus, lemon peel, and mango flavours are present with some amazing acidity which is fresh, mouthwatering and vibrant. The acidity and lemon peel touch is a pure match with the scallops and makes the pairing flawless. The beef is cooked sousvide and then finished on the grill for a charred smoky feel on the outside, but a soft succulent jelly-like rare texture on the inside. The sunchoke and sunchoke puree combined with the hazelnuts are textural blaze. The sunchokes’ nutty and sweet taste works harmoniously with the hazelnuts. The truffle powder has a “in-mouth” sensation on its own with an earthy residue. It works a treat when mixed with the béarnaise mousse for a rich earthy, creamy buttery mix which melts on the beef and infuses the various flavours for an exquisite taste experience. This wine works well with the beef. There are the usual dark berry aromas with some notes of a kind of cherry liqueur. On the palate the wine continues with the black fruit flavours, with some hints of cherry and has some light oak bite and importantly some good fresh tannins which flow into a dry finish. 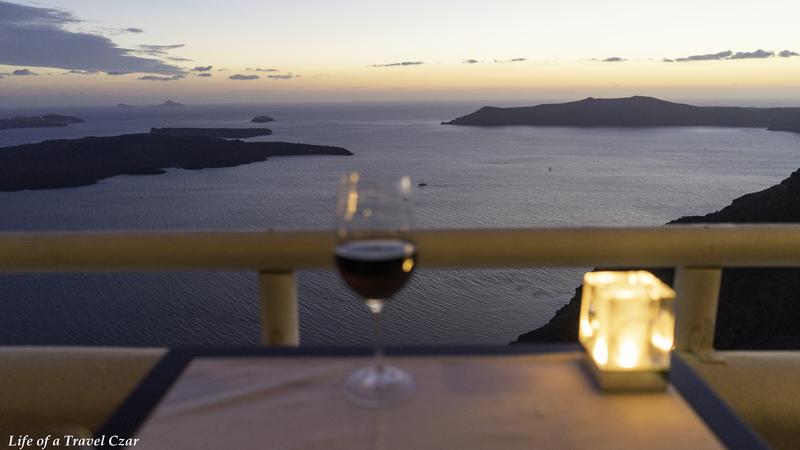 The romance of the Santorini sunset is something which needs to be seen to be believed. We wait with baited breath as the moment arrives. The bright whiteness of the sun turns into the orange-red glow, the sky loses its blueness and transforms into the pink candy reflection, darkness creeps in and night approaches with the stealth of a robber. The sun escapes over the horizon with a gradual dignified exit which is simply breathtaking. The wine and the food pale into insignificance as we are all fixated on the theatre in front of us. 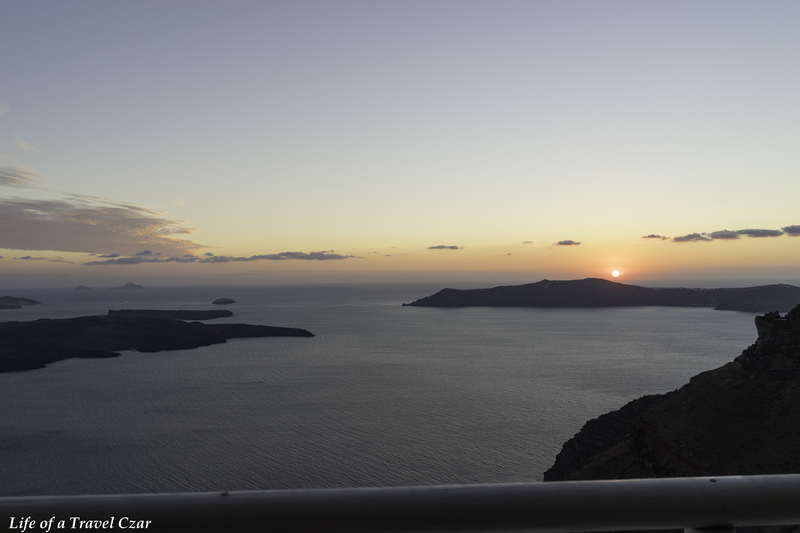 Thus there is the beautiful Santorini sunset. With the sunset over the focus moves towards dessert. The rich sensuous moist chocolate cake has this integrated chocolatey taste which injects a rich coca hit into the bloodstream. The melted chocolate is poured on top in what is a theatrical display, while the infusion of the chocolate cake, the ring and the melted chocolate provides such a rush. 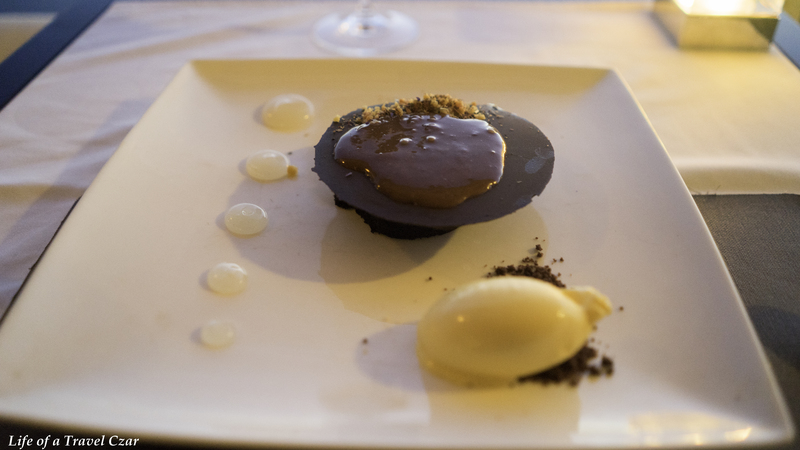 The cardamom gels balances the chocolate slightly and has a “sweet-spiced” distinctive flavour to provide another dimension to the dish. The passionfruit ice cream was a bit too much sugar for me so I decide to leave it. 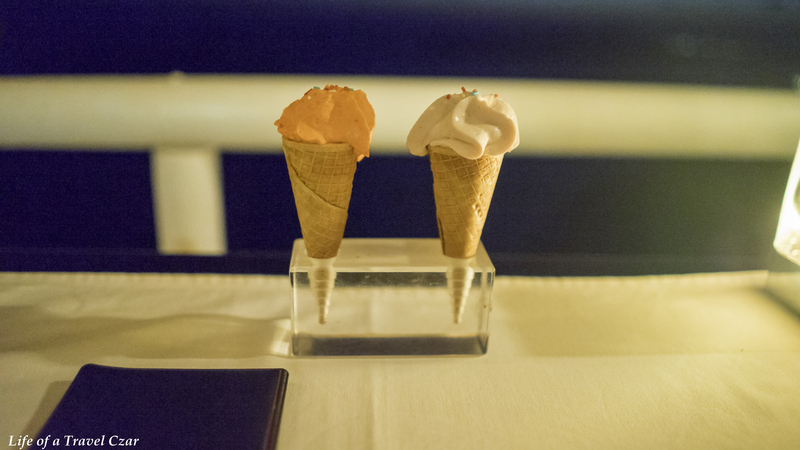 To finish off there are two beautiful mousse in cones brought out while the cheque is settled. The fluffy, airy, fruity flavours are combined with the crispy crunch of the sweet batter cone. They prove perfect to sign-off the palate for the night. The views are stunning but I found the food here certainly rivaled the view. The cuisine had some impressive modern culinary techniques mixed the relaxed Mediterranean flourish. The restaurant has an intimate fine dining feel and I simply could not fault the wait staff – the service was second to none. This would be the place to visit if you had only one night in Santorini.